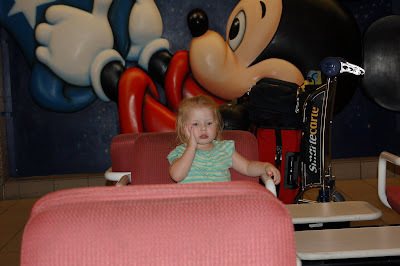 Well, Lila and I arrived in Florida, and guess where the first place we went was. 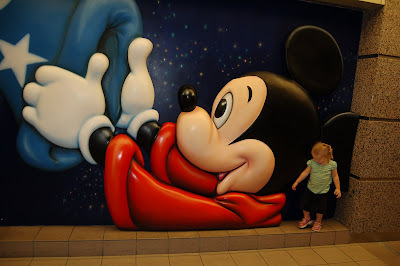 Yep, you guessed it, the Orlando International Airport. There was a huge pile up on the freeway that goes from my parents house to the airport. Two semis got into a head on collision. So the freeway was closed down, and my Mom had to figure out another way to get to us. Fortunately if you have to spend an hour or two at an airport, then Orlando is about as good as it gets. 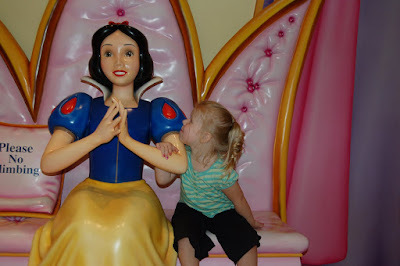 We went around to all of the stores for Disney, Universal Studios, Seaworld, and Bush Gardens. As you can see Lila didn't mind one bit. I must admit that you fooled me, Johnny. I really thought you went to Disneyworld. Lila sure looked happy! You stinker! You have to at least call us when you come to FL! What a fun airport---I havent been there yet. I really thought that that was Disney World! WE've only been once so for all I knew we just missed this. And about the gator pictures....my kids couldn't believe that was a REAL gator! ! You are a brave mom Emily!